During the typhoon, she, together with her six children, was praying fervently for God’s mercy and her family’s safety. Hours later, Lilibeth heard loud knocks on their door. It was two of their neighbors asking for help. Lilibeth said one of her kids warned her against opening the door. “Mama, huwag mong buksan (ang pinto) kasi baka tayo (yung bahay) naman (ang bumigay) (Mama, do not open the door because our house might collapse).” But moved by her compassion and the spirit of Bayanihan, Lilibeth decided to open the door and let their neighbors come in. Lilibeth and her family also had typhoon experiences when they were still residing in Paco, Manila. She said the area where their old house was located was prone to floods. “Pagkabumabaha po ay hindi talaga kami nakakatulog dahil inaabangan namin yung pagtaas ng tubig (When there is flooding, we do not sleep because we need to be prepared in the rising floodwaters),” Lilibeth recalled. Their worries about frequent flooding in Estero de Paco were addressed when Lilibeth and her family were relocated to Bayanijuan sa Southville 7 in Calauan, Laguna. She thought that her worrying was over until Typhoon Glenda hit Southville 7. According to PAGASA, Typhoon Glenda packed sustained winds of up to 150kph and maximum gustiness of 185 kph when it ravaged through Laguna and nearby provinces. “Doon ko naisip na parang buti pa sa Paco, baha lang (I thought that our situation in Paco was better because we just experienced flooding),” Lilibeth said. She cried when she saw the extent of the damage to their community. Despite what happened, she acknowledged the support given during the evacuation and relief operations. Lilibeth and her neighbors were also given temporary houses by the National Housing Authority while the damaged houses were rebuilt by Habitat for Humanity and Southville 7 residents. It has been a year since Lilibeth and her family was relocated. And just in time for their “anniversary”, they now have a sturdier and better house that they can call a home, together with the other 42 residents. Their new house has a bungalow type design built using concrete interlocking blocks. Lilibeth said the new structure is far better compared to their old house in Paco. When asked about her future plans, Lilibeth shared her dream of having a sari-sari store to augment their household income, which primarily provided by her husband who is working as a plumber in Qatar. A backyard is also available for them where they plant different root crops and vegetables such as kamoteng kahoy, malunggay, and eggplant. It was a big adjustment to Lilibeth, especially to her children to live in the province as they were used to the life in Metro Manila. But she says it was worth it. 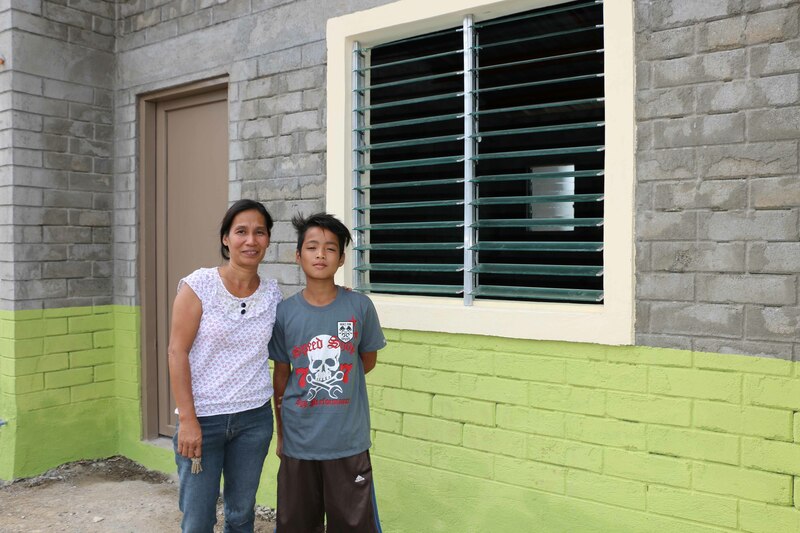 Lilibeth Bando and her son, Sherwin, standing in front of their newly reconstructed house in the community of BayaNiJuan sa Southville 7. Lilibeth Bando’s family and 42 other households returned back to their newly-reconstructed houses in January 2015. The units, which were designed and rebuilt by Habitat for Humanity, were funded by Zonta Club of Makati and Environs.